2014 Update. In 2011, after 30 years we are sorry to say we are no longer carrying R. J. Wright's new work as he has now gone direct. You can buy his work on his site directly thru him. We do have a few pieces in stock and will be carrying his work on the 2nd market in the future this year. Please contact us if you are interested in selling or buying on the 2nd market. 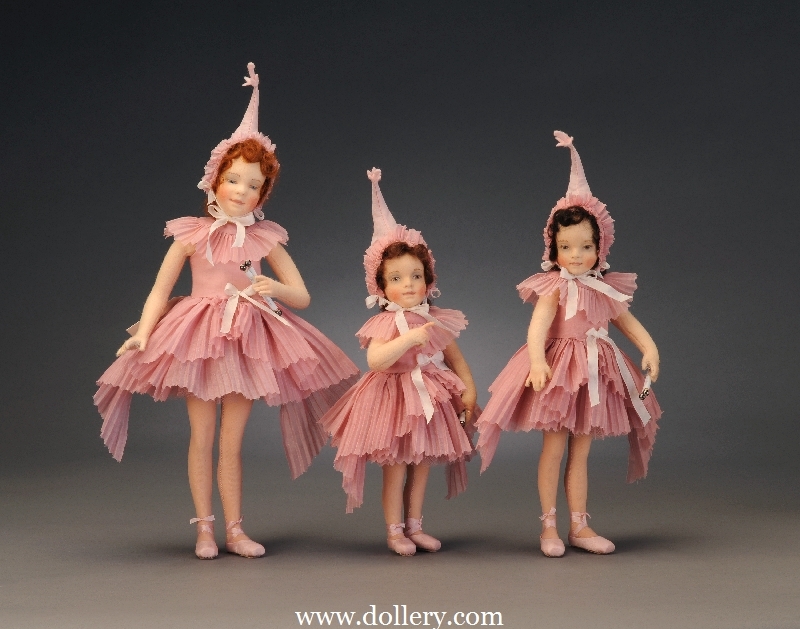 Maintenance Program for R John Wright dolls. Since 1983 all of the felt used in their dolls has been custom made in Europe (first in England and currently in Germany). The colors are custom dyed to their specifications and they specially request that the felt be treated to be both mothproofed and colorfast. This is an expensive process but RJW understands that collectors don't want to have to worry about these things which have wreaked havoc on so many wonderful antique felt dolls. 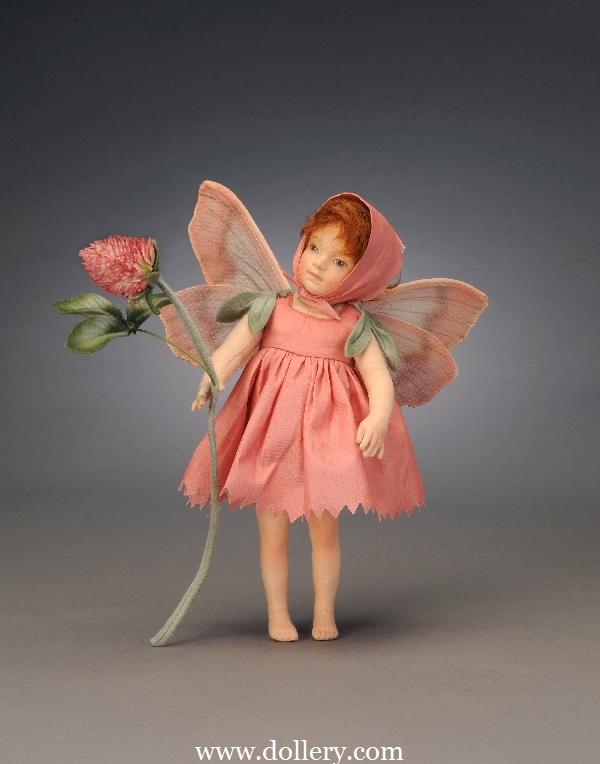 Moths and fading are not a problem, but because the dolls are made of fabric it is best to display them behind glass in a display cabinet or under a glass dome. If surface dust should occur, you can carefully blow them off with a blow dryer set on cool temperature and low setting. For smudges, careful use of an art gum eraser can eliminate unwanted spots. Felt dolls have a wonderful warmth and an unusual quality not found with other mediums. There are absolutely no synthetics used in the production of our dolls. Even the stuffing is 100% cotton. There are many new materials out there that have not proven themselves to last the test of time. If cared for properly, our dolls can remain pristine indefinitely. We hope you will consider adding them to your collection! There were 807 made. 7" (18cm) wool felt, fully jointed. We have 2 of these that have never been removed from the box or sold from our store. 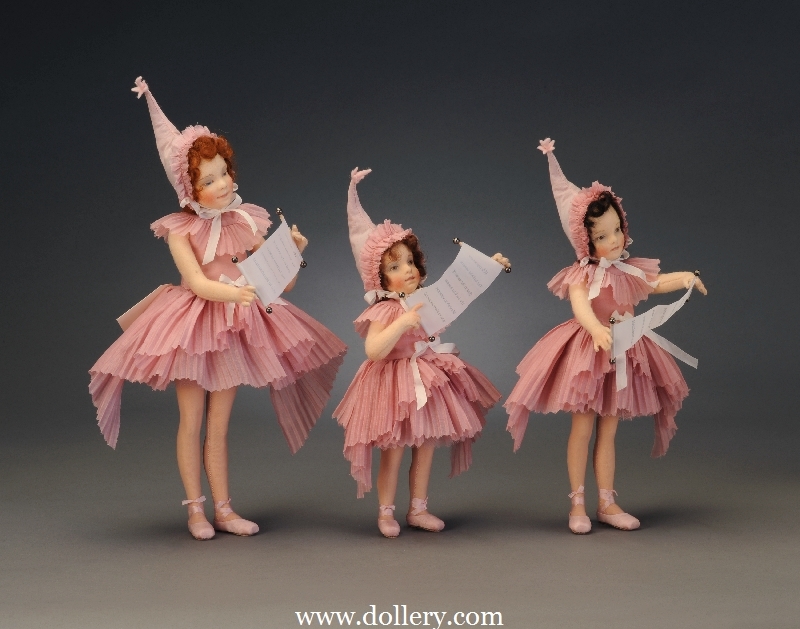 "Lullaby League" from the Wizard of Oz collection! The all-felt dolls measure 11.5 inches down to 8.5 inches and feature the new ball and socket jointing system. They are dressed in actual replicas of the iconic film costumes made of custom pleated Italian organdy. On their feet they wear authentic ballet slippers and they hold parchment scrolls with the lyrics of their song welcoming Dorothy to Munchkinland! ESTIMATED SHIP DATE: Now! When they're gone, they're gone! Faithfully based on the character played by Judy Garland in the 1939 film. She will be fully jointed and made entirely of the finest all-wool felt incorporating a realistic sculptural body and limbs and a compelling portrait face with delicate and painted features. Her lovely ands will have individual fingers and she will have a meticulously hand-knotted wig made of the finest mohair. She will be dressed in the trademark costume consisting of a white cotton blouse with rickrack trim, period undergarments, and a pinafore dress tailored of custom-made blue checkered fabric. On her feet, she will wear custom-made ankle socks and and cobbled Ruby slippers - covered in tiny sequins, rhinestones, and faceted crystals. On one arm, she will carry a custom made replica of the actual basket in the film. 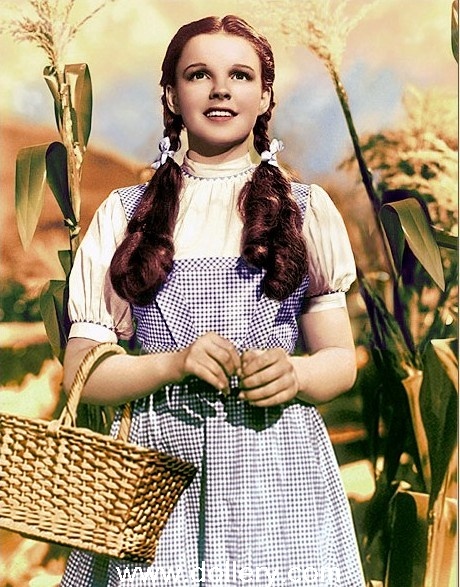 Dorothy Gale will be enclosed in a deluxe presentation box including a signed & numbered certificate. Matching numbers to other dolls in the series is available for a fee. Estimated ship date late 2010. She stands 8 1/2" (21cm) tall. She is a limited edition of 250. She is constructed of the finest all wool felt. She is fully jointed at the shoulders, hips and neck with new ball & socket jointing system with internal mechanism. 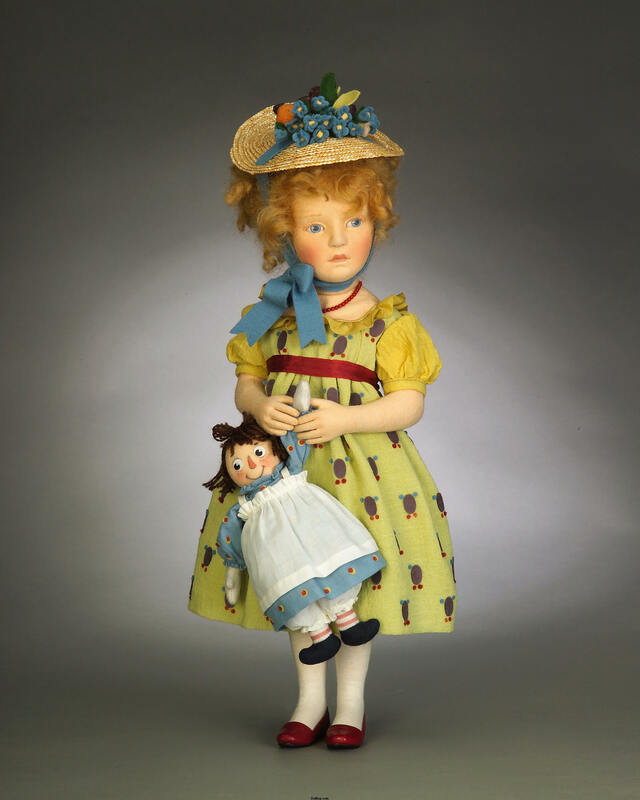 She has delicately hand painted features and a wig of the finest imported mohair. She has a sculptural molded felt body and limbs and her graceful hands are sewn with individual fingers. Her lovely wings are sewn, molded and hand painted out of fine silk organza. 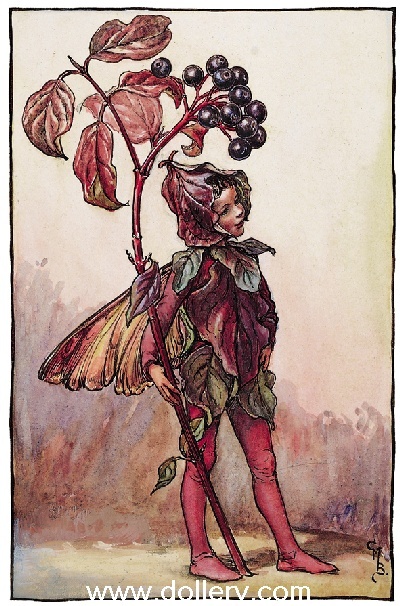 The Red Clover Fairy TM is costumed per the original illustration by Cicely Mary Barker in a silk dress with felt leaves at the shoulders and a matching scarf tied at her chin. 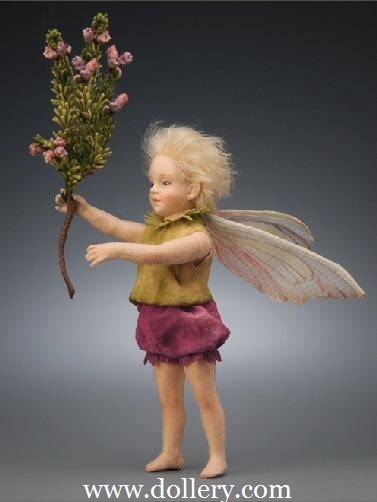 This lovely little Wayside Flower Fairy TM comes holding a realistic stalk of clover made entirely out of felt with delicate airbrushed coloration. "Peter Cotton Tail" - Dollery favorite! 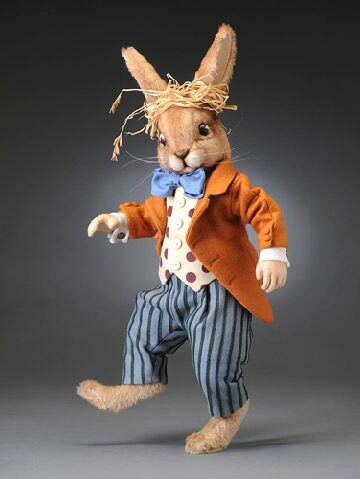 Peter Cottontail is constructed of the finest mohair plush and wool felt. He is fully jointed and stands approximately 15" tall. His beautiful sculptural face and ears have detailed coloration and he features felt-backed glass eyes, a molded felt nose, and inserted whiskers. Peter Cottontail holds a springtime bouquet of detailed felt violets and pussywillows made entirely of felt and mohair plush. 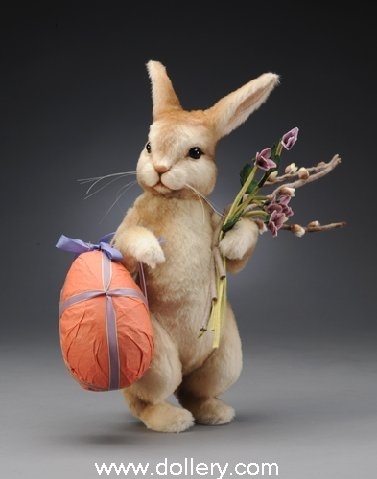 He also carries a paper Mache Easter egg gaily wrapped in paper with silk ribbons. For effortless display, Peter Cottontail will come complete with a built-in removable metal stand. 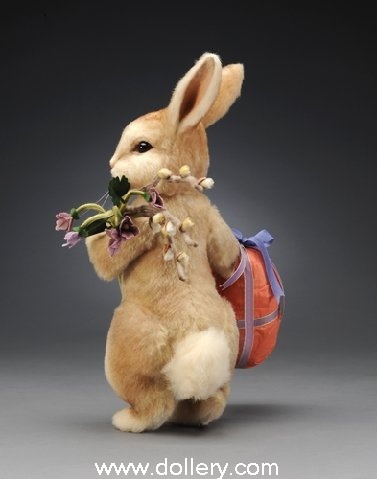 Peter Cottontail will be produced in an edition limited to only 200 pieces worldwide. We would encourage you to order early to avoid disappointment! The suggested retail price is $825.00 prices subject to change . We are taking orders now with 25% down, balance due when in or extended layaway available. Email kmalone@dollery.com or call 781-447-6677 ext 22 in state Ma or 800-447-3655 ext 22 out of state. 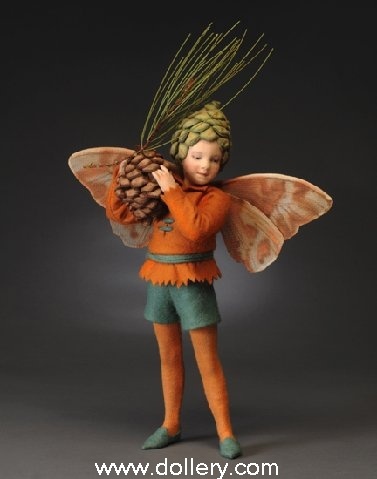 The Xmas Tree Fairy, $795.00, is constructed of the finest all wool felt. She measures 11 1/2" tall and is fully jointed at shoulders, hips and neck with new ball 7 socket jointing system with internal wood mechanism. 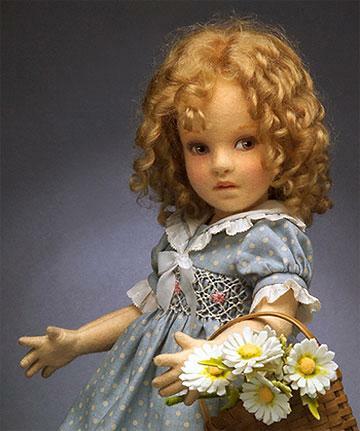 She has delicately hand painted features and a wig of the finest imported mohair. She has a sculptural molded felt body and limbs and her graceful hands are sewn with individual fingers. 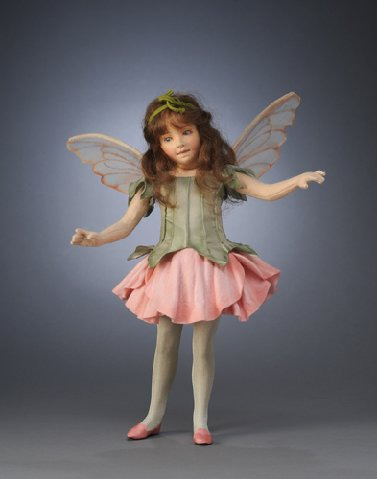 Her magnificent wings are sewn, molded and hand painted out of fine silk organza. Her dress is a delicate fine organdy and French lace embellished with silk ribbon. She comes wearing her star headband and holding her magic wand. She will be produced in an edition of 250 worldwide. Each will come enclosed in a deluxe RJW presentation box with the accompanying signed and numbered certificate of authenticity and the forms for owner registration. 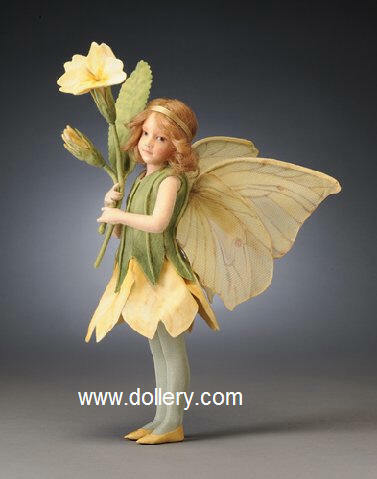 As port of the Flower Fairies Collection, matching numbers are available for a fee $25 to the other dolls in the series. Only a limited number will be produced for the 2009 Xmas season. Hurry!! Available now for shipping. 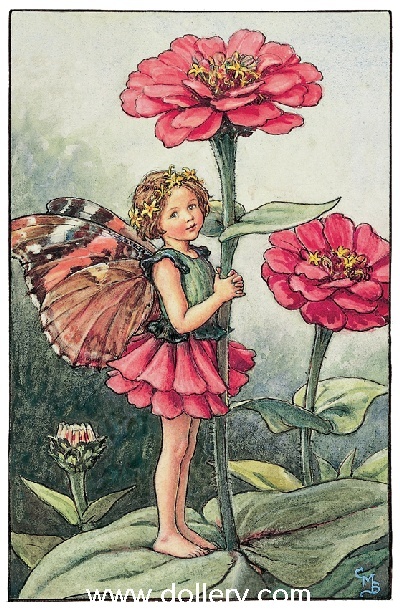 FLOWER FAIRIES - Brand new Series for 2009! Dollery favorites! completely of molded & hand painted individual felt pieces! 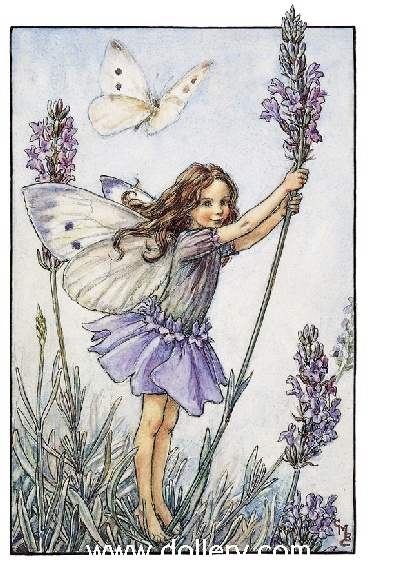 (Matched number sets of fairies still available per request, $25). Goldilocks and the Three Bears Series! New version of Goldilocks for 2009! Email kmalone@dollery.com or call 781-447-6677 in Ma or 800-447-3655 out of state. 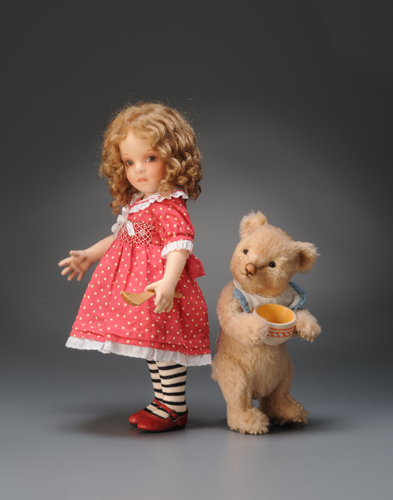 Goldilocks and her "Three Bears" - Dollery Favorite! The Three Bears are made of custom made mohair plush with sculpted felt paw pads with resin claws, and internal growlers. Each bear will features German glass eyes and a molded leather noses. Baby Bear measures 8" tall. He comes wearing a short felt jacket for his walk in the woods. Mama Bear measures 14". She has interior jointing in her wrists. She wears an embroidered felt capelet for outdoors. Papa Bear measures 15". He also features the interior wrist movement. He has an open mouth with a felt tongue and inserted resin teeth. Papa Bear is costumed in a corduroy vest with leather buttons and a felt Tyrolean style hat. In one pocket of his vest he has a custom-made carved wooden pipe. Goldilocks is individually priced as shown below. Goldilocks - Dollery Favorite! Beginning to ship mid-September 2008. Goldilocks is constructed of the finest all wool felt. She measures 12¼" tall and is fully jointed for playful posing. Goldilocks premieres a completely new face sculpt with delicately hand painted features. 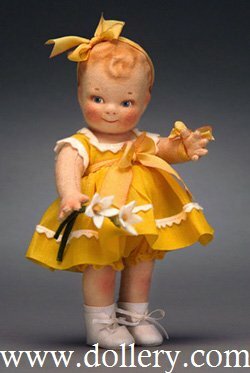 Her golden curls are made of fine imported mohair and her sculptural, childlike hands are sewn with individual fingers. 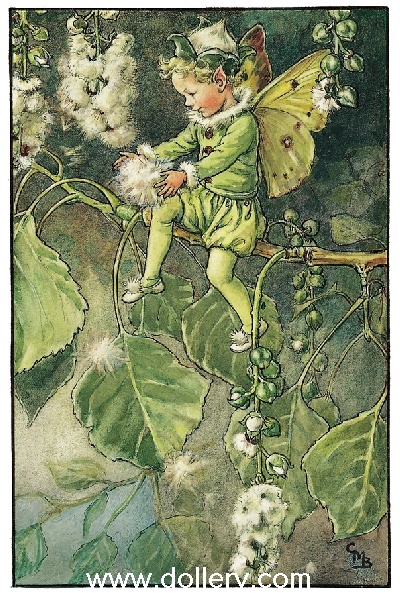 Goldilocks is dressed in a cotton summer dress with a hand smocked bodice and dainty Swiss embroidered trim. She wears custom made stockings, fine cotton undergarments, and hand cobbled red leather shoes. On one arm is a custom woven basket filled with handmade felt daisies. Alice in Wonderland Series - new Queen of Hearts for 2009 - also just posted the photo of the actual "March Hare"! Ltd to just 750 World wide, 17" inches, fully jointed, hand rooted Mohair Wig. Based on book by Louis Carroll and Sir John Tenniel. Matching numbers available for the Alice in Wonderland and Rabbit up to the first 250 of the edition. $1,475.00 - Email kmalone@dollery.com or call 800-447-3655 ext 0 out of state or 781-447-6677 ext 0 in state Ma. The Queen of Hearts - new for 2010! Approx. 17" Tall - Est: Delivery 2006 - SORRY, SOLD OUT. 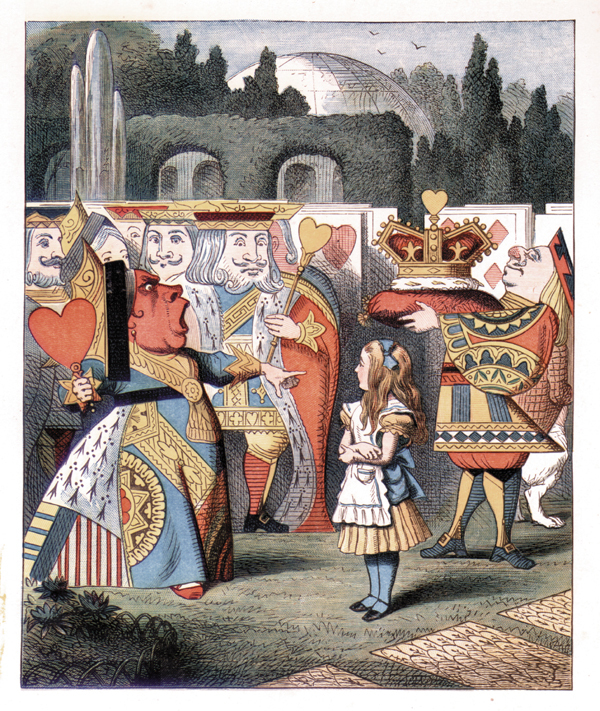 R. John Wright presents The Nursery Alice. 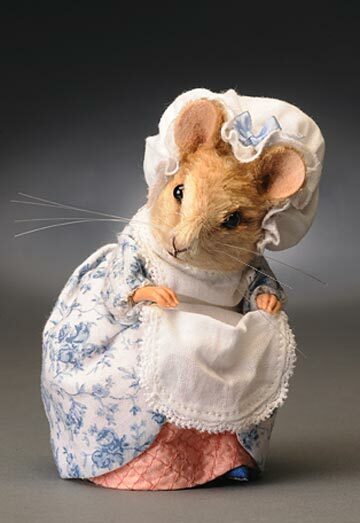 This lifelike doll and her pig are modeled after Sir John Tenniel's illustrations in the original book from 1889. Alice stands approximately 17" tall and is fully jointed. She is made from the finest all wool felt with hand-painted detailing. Her dress is a sunny yellow felt covered by a cotton pinafore trimmed with teal colored silk detailing. Her wig is constructed of hand-tied mohair, creating a captivatingly soft effect around her face. It is tied with a teal bow. A sash, teal stockings, and meticulously hand constructed leather shoes complete her appearance. Her pleated apron even has a tiny functional pocket. A little brooch with a scripted letter "A" decorates her collar. Her "baby" pig is made of wool felt plush just the right shade of pink to bring him to life. He has glass eyes and a jointed neck, allowing for the most realistic posing possible. 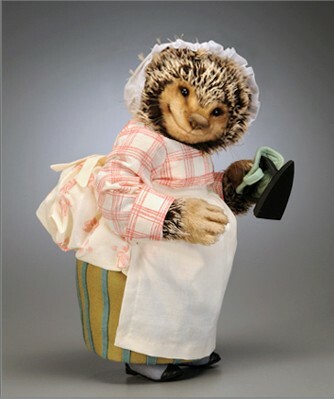 The pig is wearing a silk trimmed cotton batiste bonnet trimmed in lace and tied with a satin ribbon. This set will come in a deluxe presentation box complete with a reproduction of the original artwork. Matched numbers with Alice in Wonderland may be requested. 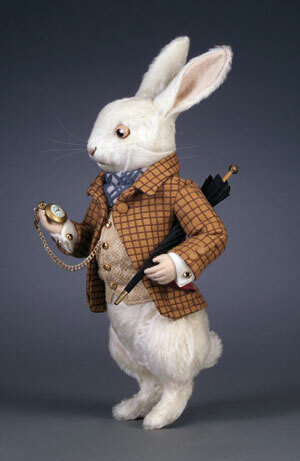 The White Rabbit 13" inches, Mohair plush and molded felt hands with individual fingers. Fully jointed. Leather covered eyes and hand embroidered features. Spring Time Series! Dollery Favorite! 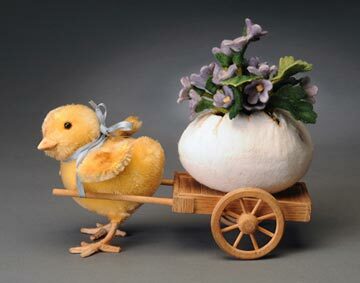 Mohair chick pulling cart w/Holiday Egg, felt beak and felt feet. Jointed at neck w/movable wings. Cart is made out of hardwood w/movable wheels. 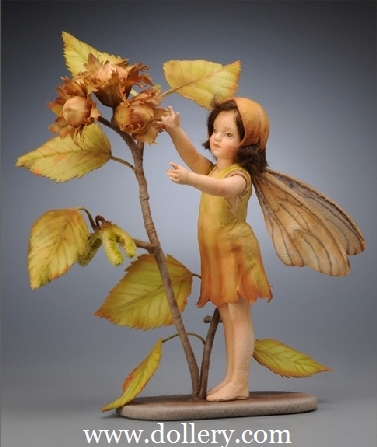 The Seasons of Childhood Collection (below) - Stunning. It is so nice to see more of John's beautiful classic children that we saw in the eighties. Dollery Favorites! Email kmalone@dollery.com or call 800-447-3655 out of state or 781-447-6677 in Ma. Shown below are the "Chinaman Brownie" and the "Indian Brownie." Produced in very small editions of just 250 pieces, each is highly detailed and made entirely of all-wool felt. We want to make you aware of this exciting new series. Both are currently available for immediate shipment while supplies last! The suggested retail is $535. Matched numbers are offered for collectors interested in acquiring matching pieces in the collection. PALMER COX is famous the world over for his delightful children's books on the fictional creatures known as the "Brownies." His inspiration for the Brownies came from the Scottish folktales he learned from his mother which featured the Brownies, or little members of the faerie or goblin world. He described them this way: "imaginary sprites who delight in harmless pranks and helpful deeds. They work and sport while weary households sleep, and never allow themselves to be seen by mortal eyes." Considered a pioneering artist of the Platinum Age of Comic Art, Palmer Cox brought the Brownies of childhood myth to life with his detailed illustrations and classic verse/story-poems. The first collection of Brownie stories was published in 1887 and sold over a million copies - an unheard of number for that time. Cox would go on to publish 15 more Brownie books - leaving behind a legacy of delight for children and the young-at-heart. It gives us great pleasure to introduce his beloved Brownies for the very first time in the medium of molded felt. Let me know if you need any further information. 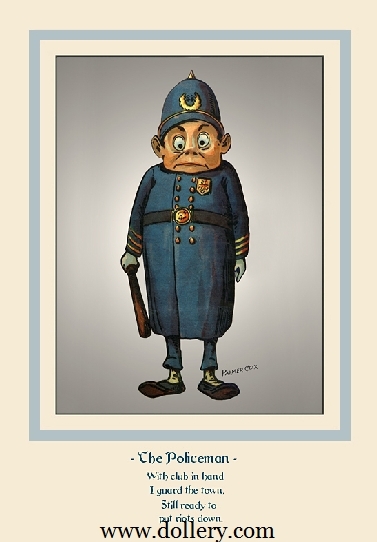 According to RJW: This whimsical character made his appearance in Cox's first Brownie book published in 1887 titled "The Brownies, Their Book." He wears a traditional felt costume consisting of a tunic with tiny custom-made brass buttons, short trousers, a coolie hat, and peasant slippers. 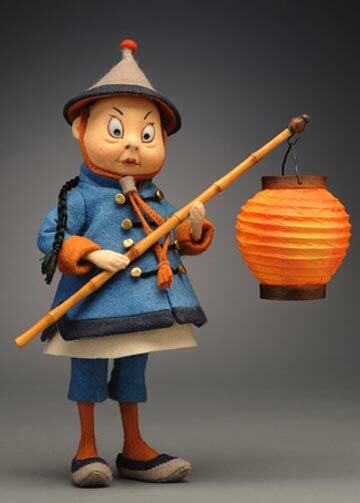 As a wonderful added accessory, he holds a handcarved wooden bamboo-style pole with a hanging paper lantern. He comes inside a deluxe RJW presentation box with a signed and numbered Certificate of Authenticity and the forms for owner registration. According to RJW: This whimsical character made his appearance in Cox's second Brownie book published in 1890 titled "Another Brownie Book." Based on the original Palmer Cox illustrations, the Brownie Sailor from RJW is made of the finest all-wool felt and jointed at the neck and shoulders. He has a molded felt character face, hand painted features, a mohair wig, and incredibly tiny sculptural hands. 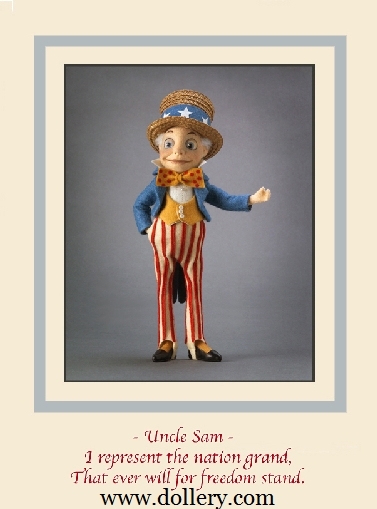 Measuring 8 1/2" tall (without his hat), the Sailor has heavy wire inside his legs to enable him to be self-standing. 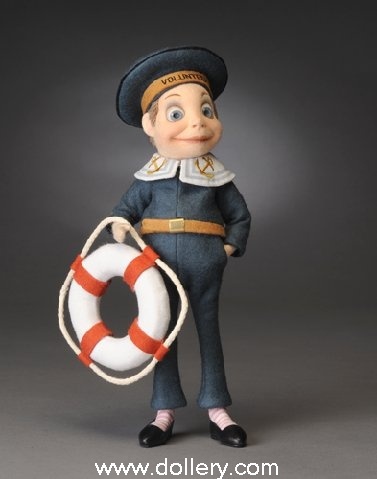 The Brownie Sailor is set to sail the seas in his traditional navy blue felt costume cosisting of bell-bottom trousers and matching top with wide collar decorated with embroidered anchor motifs. his nautical cap has the word "Volunteer" embroidered across the hatband and on his feet, the Sailor wears striped sox and hand cobbled leather shoes. He holds a detailed miniature life preserver. No detail has been spared to bring this delightful Palmer Cox character vividly to life. 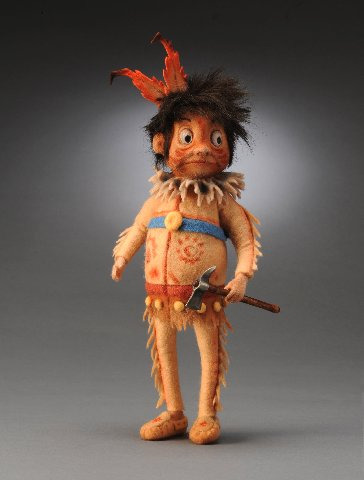 Based on the original Palmer Cox illustrations, the Brownie Indian from RJW is made of the finest all-wool felt and jointed at the neck and shoulders. He features realistic coloring, hand painted features (including 'war paint'), a mohair wig with felt feathers, and incredibly tiny sculptural hands. Measuring 8 1/2" tall he has heavy wire inside his legs to enable him to be self-standing. Based exactly on the Palmer Cox illustrations, the Indian wears a traditional "deerskin" costume made of felt consisting of belted shirt with fringe decorated with hand painted designs, tiny felt covered buttons, fringed leggings, and mocassins. He holds a handcrafted wood and metal tomahawk. No detail has been spared to bring this delightful Palmer Cox character vividly to life. 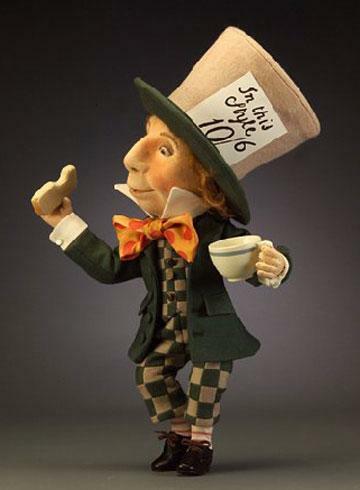 Based on the original Palmer Cox illustrations, the Brownie Irishman from RJW is made of the finest all-wool felt and jointed at the neck and shoulders. He has a molded felt character face, hand painted features, a mohair wig, and incredibly tiny sculptural hands. 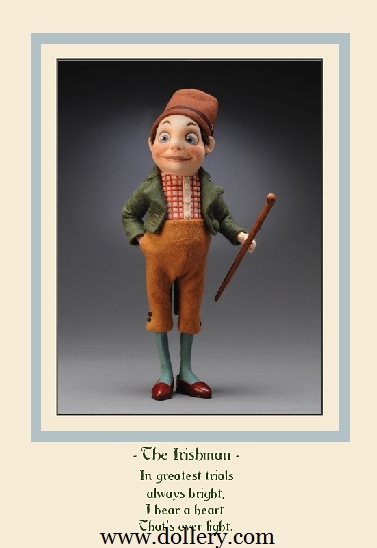 Measuring 8 1/2" tall (without his hat), the Irishman has heavy wire inside his legs to enable him to be self-standing. The Brownie Irishman hails from the Emerald Isle outfitted in a tailored felt swallow-tail jacket, tattersall shirt, knee-length felt breeches with working pockets, a tall felt hat, and hand cobbled leather slippers. Included is a knobby hand-carved wood 'shillelagh' walking stick. No detail has been spared to bring this delightful Palmer Cox character vividly to life. Based on the original Palmer Cox illustrations, this Brownie from RJW is made of the finest all-wool felt and jointed at the neck and shoulders. He has a molded felt character face, hand painted features, a mohair wig, and incredibly tiny sculptural hands. Measuring 8 1/2" tall (without his helmet), he has heavy wire inside his legs to enable him to be self-standing. The Brownie Policeman wears a tailored felt policemen's uniform consisting of an overcoat with raid trim and tiny custom made brass buttons. His badge is displayed proudly on his chest. the authentic outfit includes matching trousers and a molded helmet with guilt insignia and finial. Cobbled leather shoes and a handcarved billy club complete his period costume. No detail has been spared to bring this delightful Palmer Cox character vividly to life. Based on the original Palmer Cox illustrations, this Brownie from RJW is made of the finest all-wool felt and jointed at the neck and shoulders. He has a molded felt character face, hand painted features, a mohair wig, and incredibly tiny sculptural hands. Measuring 8 1/2" tall (without his cap), he has heavy wire inside his legs to enable him to be self-standing. He wears an authentic jockey uniform consisting of a brimmed cap and tailored shirt made of fine 100% silk fabrics, and jodhpur breeches made of all wool felt. His tall hand cobbled boots are made of the finest top grain calfskin and in one hand he holds his riding crop. No detail has been spared to bring this delightful Palmer Cox character vividly to life. Based on the original Palmer Cox illustrations, this Brownie from RJW is made of the finest all-wool felt and jointed at the neck and shoulders. He has a molded felt character face, hand painted features, alpaca hair, and incredibly tiny sculptural hands. Measuring 9 1/2" tall (with his hat), he has heavy wire inside his legs to enable him to be self-standing. He wears an all-felt patriotic costume consisting of striped trousers with working pockets, waistcoat, tie, and swallow-tailed jacket. On his head is a woven straw top hat with star-emblazoned hatband and on his feet he wears tiny cobbled leather shoes! No detail has been spared to bring this delightful Palmer Cox character vividly to life. 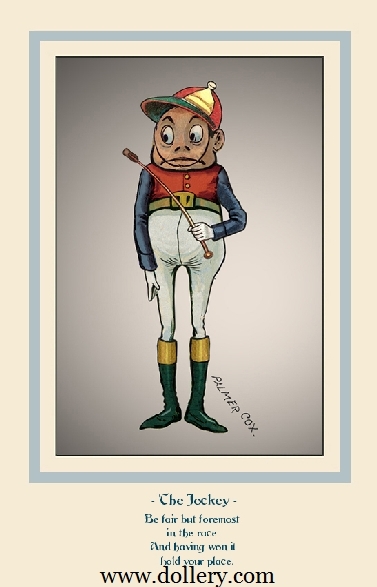 According to RJW: This whimsical character made his appearance in Cox's 4th Brownie book published in 1894 titled "The Brownies Around the World." Based on the original Palmer Cox illustrations, the Brownie Canadian from RJW is made of the finest all-wool felt and jointed at the neck and shoulders. He has a molded felt character face, hand painted features, a mohair wig, and incredibly tiny sculptural hands. Measuring 8 1/2" tall (without his hat), the Canadian has heavy wire inside his legs to enable him to be self-standing. 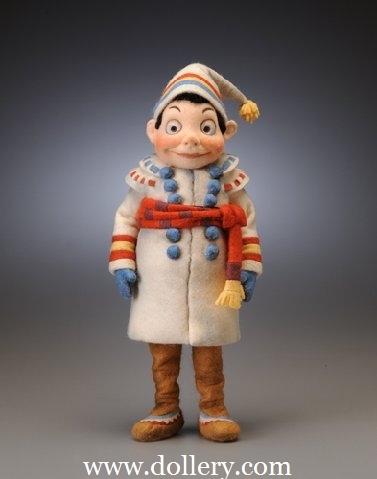 He wears a colorful felt costume consisting of a greatcoat with felt covered buttons and sash, detailed mukluk boots, and a matching tasseled cap. No detail has been spared to bring this amusing Palmer Cox character vividly to life. 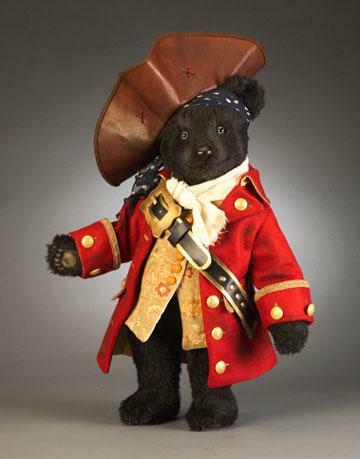 Bears at Sea Collection - Coming soon are "Pirate Quartermaster" and "Pirate Mate" - photos not available yet. Contact kmalone@dollery.com for automatic updates when available. The newest edition to the Bears-At-Sea collection is the Pirate King, the premiere pirate character in the Collection. The Pirate King is fully jointed and made of the finest custom-made black alpaca plush with detailed shading. His felt paw pads and individually inserted resin claws give the Pirate King a menacing realism. His wonderful character face features blue glass pupil eyes and a molded leather nose. He will come wearing a fully lined brocade waistcoat and detailed Great Coat embellished with pockets, gilt braid trim, and brass buttons. Around his neck is a leather baldric belt studded with brass "RJW" buttons and on his head is an authentically designed leather pirate's hat. Matching numbers to other bears in the collection will be provided subject to availability. Future additions to the series will include a Pirate Quartermaster, Pirate Mate, and the Pirate's Parrot. Alaca; Fully jointed; Black glass eyes; leather nose; Felt captain's costume. The Captain does not come with binoculars as pictured. Instead RJW put a nice insignia on the Captain's hat. 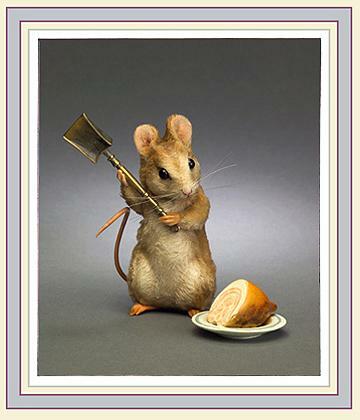 Beatrix Potter Collection - Email kmalone@dollery.com for high resolution images. 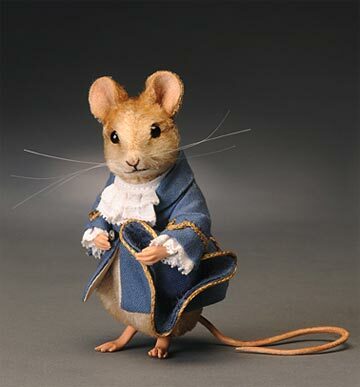 New are "Lady" and "Gentlemen Mouse" - so cute! $485.00 - Estimated ship date 2008! First Introduced at EXPO 2006 along with Peter Rabbit. Made entirely of molded and hand painted felt, several of the vegetables actually pull out of the 'ground'! 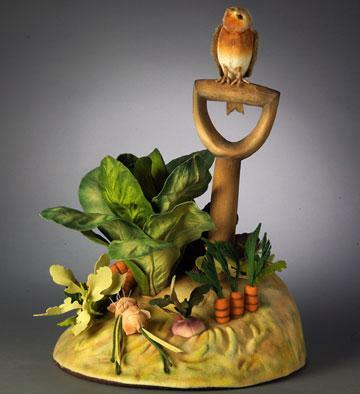 An authentic hand carved wood garden "dibber" planting tool is topped by an adorable mohair Robin with glass eyes, felt feet, and a jointed neck. Jeremy Fisher - Notified by R. John Wright that they are no longer doing this piece. R. John Wright presents Marcella and Raggedy Ann. 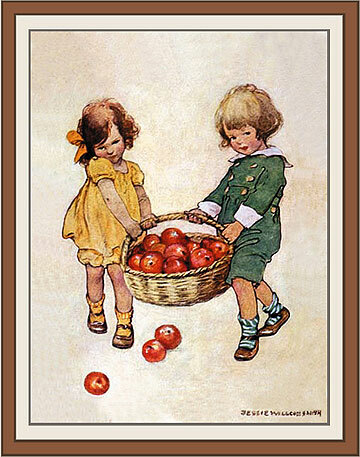 The character of Marcella was modeled after illustrator Johnny Gruelle's real life daughter, Marcella. Marcella was the creative muse for Gruelle's original Raggedy Ann stories. When she was twelve, Marcella became extremely ill and became bedridden. Her father found an old rag doll in the attic and used the doll to create fantastic stories for his daughter to entertain her throughout her illness. 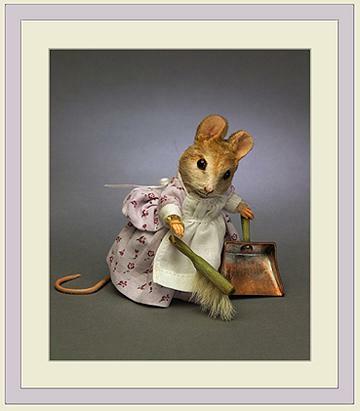 Following her death, Gruelle published the stories to share with other children. 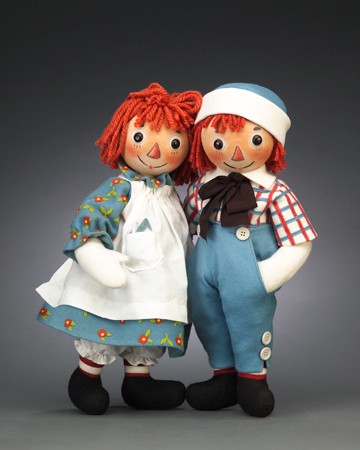 The stories became the adventures of Raggedy Ann and Andy. In this very special edition, Marcella will be modeled after Gruelle's original artwork. She will stand approximately 17" tall and will be made of fine all wool felt with a hand knotted mohair wig. Her body will be fully jointed and her portrait sculpted face will be hand painted. She will come dressed in her yellow cotton dress. Her bonnet will be trimmed with felt fruit and flowers. In her arms she will hold a floppy version of Raggedy Ann. This set will come in a deluxe presentation box complete with ownership forms and a reproduction of the original artwork. Based on the immortal illustrations of artist Johnny Gruelle and the original 1918 book, Raggedy Ann and Andy come to life in R. John Wright's signature style! They are approximately 17" tall and will be made of custom all-wool felt with delicate coloration, leather-covered button eyes, and removable clothing. This will make the first time this beloved doll has been produced in the felt medium! He will be jointed at the neck, shoulders, hips and knees for expressive posability. Matching numbered sets are available! Jointed neck, leather harness, hand painted features, leather covered eyes. $95.00 each - Taking orders now. 25% down, bal. due when in or we can work with you on extended 12 month payment plan! Email kmalone@dollery.com or call 800-447-3655 ext 0 out of state or 781-447-6677 ext 0 in state Ma. $295.00 each - Email kmalone@dollery.com or call 800-447-3655 ext 0 out of state or 781-447-6677 ext 0 in state Ma. Ltd to just 500 world wide, Final piece in the baby bear collection. $595.00 Email kmalone@dollery.com or call 800-447-3655 ext 0 out of state or 781-447-6677 ext 0 in state Ma.